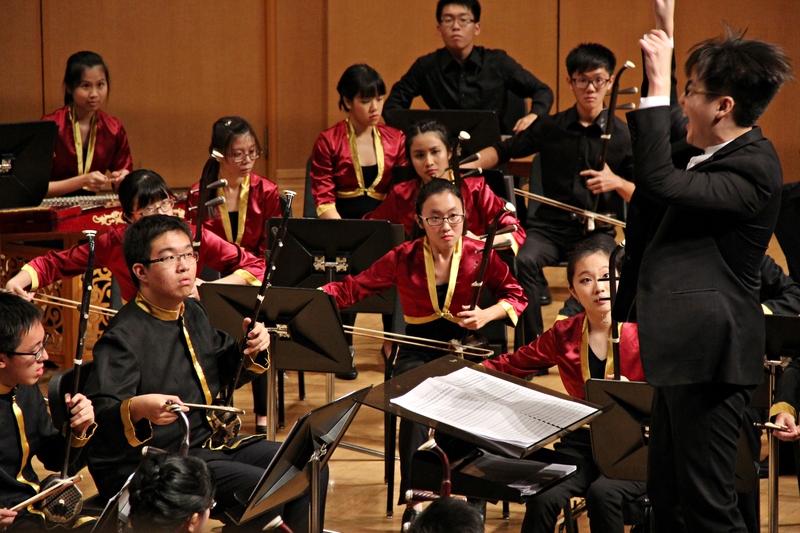 On the 16th of May, Raffles Institution Chinese Orchestra (Year 5-6) (RICO) marked their return to the public limelight after two years with their highly anticipated concert, 《叙》 or Recollections. Held at the Singapore Conference Hall, Recollections explored the emotions one feels when reminiscing the nostalgic past, by balancing longing and heartfelt yearning with the joy of childhood memories. Juggling the complexities of blending Chinese melodies and Western harmonies, this specially-themed evening, coupled with the unconventional and unexpected use of instruments, enthralled audiences with both familiar tunes and ancient soundscapes. Just as how diverse and wide-ranging our recollections are, the varied repertoire that RICO presented shattered any misconceptions that the orchestra was limited in form or genre. RICO opened with one of the main highlights of the evening – an enchanting medley incorporating some of the most inspiring and popular tunes from The Phantom of the Opera. Arranged by Mr. Tan Bing Liang, a ‘RICO alumnus-turned-dentist’, the medley started with a simple, yet reverberating keyboard solo of Masquerade. This simple melody seamlessly transitioned into an immersive orchestral playing of Think of Me. RICO continues to take us through this riveting journey with another effortless passage, where cellist Rui Chen (one out of six secondary 4 orchestral members) took on the role of Raoul, and Kim Ji Hwan (15A01C) the role of Christine in the heartwarming duet All I Ask of You. With the flawless solos of the cello and the gaohu (a smaller, higher-pitched version of the erhu), Ji Hwan commented how his maiden solo performance was “nerve-racking yet exhilarating at the same time”. The audience, which was busking in the romantic atmosphere, was mercilessly hurled into the sinister, dark world of the Phantom. The most iconic and stirring song, The Phantom Of the Opera, resounded forebodingly through the hall, drawing the audience into the mystery and dangerous unknown of the Phantom’s lair. The audience is then led from fear to a solemn, heart wrenching delivery of Wishing You Were Somehow Here Again, evoking sadness and sympathy in their hearts for the loss of Christine’s father in the original musical. RICO closed the medley with a self-descriptive piece, Music of the Night, as student conductor Benedict Lim faded the emotion-provoking medley into silence. For a moment, the audience was left dumbfounded, but snapped out of their enchanted states to mask the silence with roaring applause. As the main orchestra took their leave, a small chamber ensemble emerged onto the stage to perform their second piece, Dun Huang. Departing from the Broadway strains of Andrew Lloyd Webber, the audience was plunged into the mysterious and exotic locale of the Silk Road. Set against a rich and groovy accompaniment, influenced by the fusion of Indian and Western elements which capitalised on the unique sounds created by the pipa and the zhongruan, the whole musical landscape was inspired by the cultural melting pot of Dun Huang as a blend of both Eastern and Western styles. Furthermore, it functioned as an exciting and refreshing twist to the otherwise more commonplace pentatonic scale employed by traditional Chinese instruments. Beginning with a bangdi solo by Sue Jean, the small ensemble then drove the music forward passionately, shaping the seemingly dissonant notes into complementary layers of euphonious and energetic music. The intensity was then kicked up a notch when the performers started to rap on their respective instruments, conjuring a fast-paced rhythm which eventually culminated in rapid and furious playing, which concluded this colourful piece. Special mention should be given to these talented performers, who constantly had to follow each other’s pulses consistently in order to be synchronised with each other. The chemistry they had with each other was a testament to the amount of effort they had put in to perfect and to coordinate the entire piece of music. The animated and spirited atmosphere kindled by Dun Huang was in stark contrast to the next piece that followed, Spring of the Seaside. This time, the number of instruments decreased to just two, as sheng soloist Nicholas Teo and pianist Chua Zhe Xuan commanded the stage with a quaint duet. The rolling of the arpeggiated chords of the piano symbolised the ebb and flow of the waves as it reaches the shore, while the poetic style of the sheng drew one’s attention to the allure and charm of the seaside, and its striking scenery. With an almost intriguing quality to the music as its softness and gentleness drifted from the sheng and the piano, it was then superimposed upon by the introduction of a livelier rhythm, making the middle sections more passionate and cheerful. The piece soon ended with the mellow mood set in the opening, coming full circle. One of the night’s highlights was their fourth piece, The Game of Drums, a contemporary piece which brought Chinese percussion music to another level. 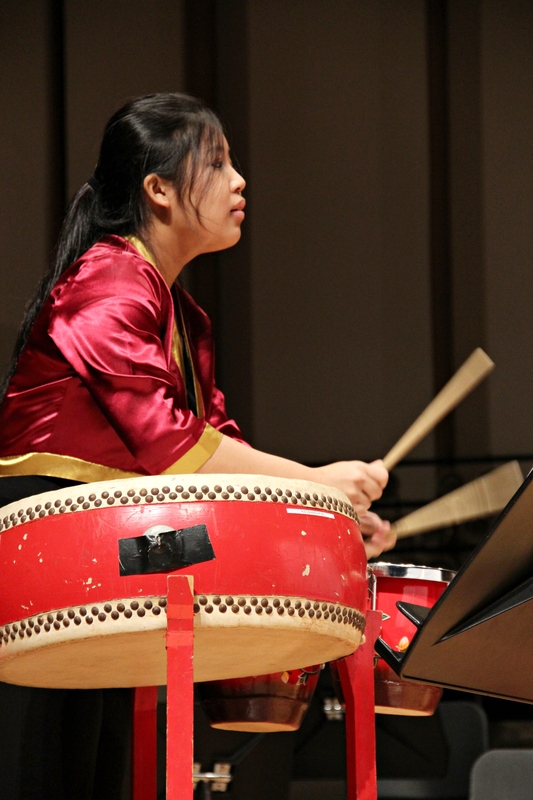 Commissioned by and premiered at the Chinese Classical Music Special Concert at Paris in 2000, RICO’s rendition of this unorthodox piece explored the dynamic techniques of Chinese percussion music with an upbeat tempo. The beauty of the piece lies in how the different rhythms interlocked to create a unique and exciting feel and atmosphere to something merely accompanying in nature. The wholly percussion sound allowed the soloists to showcase the full strengths of the section in all its glory: the furious rapping of the drumsticks, the superb skill in the timing and coordination of the whole piece, and in never overshadowing the other percussionists by being too loud. The fiery piece then ended with a loud cry from the performers, drawing to a close the first half of the concert. The final two pieces of the concert dealt with the languid and unhurried poetic paintings of Chinese landscapes and symbolic entities. Delving into Southern China, Music of the Alleyways brought us through the wide streets and narrow alleys of the bygone days. The calm and soothing opening quickly transitioned into a reverberating and joyful folk tune, which employed a call-and-response technique within the plucked strings section. The playfulness of the entire piece recalls a time of optimism and childlike imagination, and this was accompanied by an increase in tempo in the uplifting themes in the gaohu and the flute. Eventually though, it ended off with a slow and unhurried, yet enrapturing, tune which led into the next and final piece. The Golden Lotus Flower enticed the audience with its magical tune and symbolism of hope. The focal point of the piece was the use of the yunluo in both the opening and the conclusion, while the distinct and mysterious chords were enhanced by the absence of the pentatonic scale. Alternating between grand and dramatic sections with the sublime and soothing, it aptly describes the golden lotus flower: a divine and beautiful flower which represents purity. With the yunluo in the limelight once more, the boldness and loudness of the discordant chords convalesced into one majestic and dignified blast of music, thus signalling the end of the piece. The audience then exploded with a thunderous cheer as the orchestra took their bow, and conductor Mr Yang Ji Wei was presented with a bouquet of flowers and a teddy-bear plush toy. Before long, the audience chanted “encore!” in synchrony. Much to the audience’s surprise, Mr Yang handed his conducting baton back to student conductor Benedict Lim. The audience cheers excitedly from the conceding of their request, but quickly falls silent as the familiar tune of Those Bygone Years《那些年》, from popular Taiwanese romance movie You Are The Apple Of My Eye, starts to play. The audience sighs with heartwarming satisfaction as the love song filled the hall. The evening then finished with another encore piece, RICO’s rendition of Cups, a song popularised by American actress Anna Kendrick. Providing a new twist on a familiar melody, it overturned any expectations that the Chinese orchestra was not versatile enough to be able to adapt to the modern harmonies of pop music. The percussion imitated the beat of the cup game used in the song, while the rest of the ensemble gave voice to the original tune; this simple arrangement presented an invigorating change from the overplayed version. Mr. Yang also invited the audience for a little interactive session when he got everyone to clap along with the orchestra. The energy which then pulsated from the entire hall brought the whole performance to a climax, and ended the concert off with a bang. Mr Yang also went on to thank the audience for their presence: “I think the orchestra would like to mention and appreciate our audience, or the concert would not have been successful if there’s nobody watching.”The audience did enjoy the concert – the concert hall was packed full of supporters and even teachers who came down to show encouragement for the performers. “It was very unexpected,” Jamie [15A01C] said. 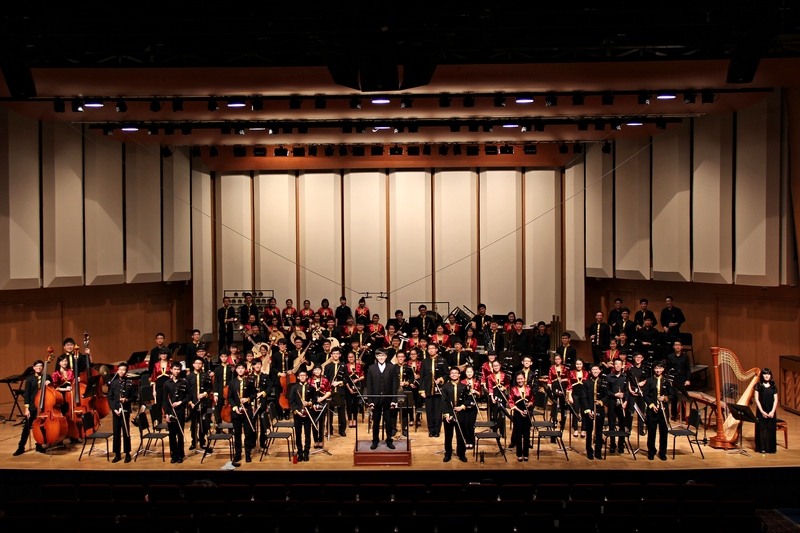 “This is my first CO concert and I didn’t think that it would sound like this; it was really good!” Indeed, the whole performance was of exceptionally high standards, and affirmed the commitment each RICO member showed for the CCA and for their concert. On behalf of Raffles Press, we would like to congratulate RICO on their astounding performance, and we wish them all the best in future endeavours. This concert will truly be a part of our recollections.